Pineapple Guesthouse comprises 26 private rooms, a ten bed dorm and a cafe. The private rooms are all comfortably furnished with good mattresses! 19 of the rooms have air-conditioning, cable TV, en suite bathroom with hot shower, a safe, large fridge and free wifi access. 16 of these are designated superior as they have balconies. Standard rooms have similar facilities but are at the back of the guesthouse with no balconies. Twin rooms with balcony are found in a different building. We have king (six foot beds), twin and triple rooms available. The triples consist of a double and a single bed, so two of you will have to share a bed. The dorm room is been very popular. 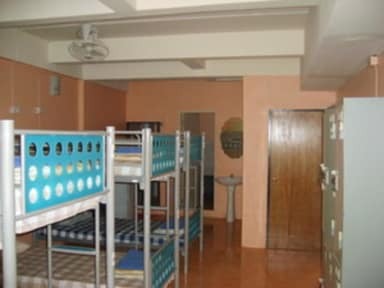 It's a ten bed mixed dormitory. 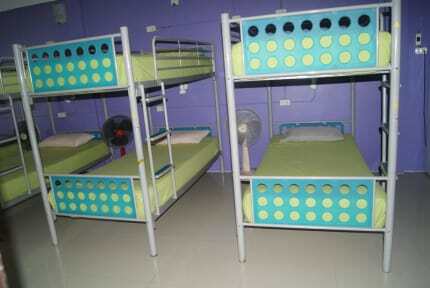 Each bed has its own fan and there's aircon at night from November until April only. Linen and towels are provided and changed regularly. There's a choice of hot and cold showers plus two sinks and a toilet within the dorm area with additional facilities in Pineapple Guesthouse. Each bed has its own light, electric socket for recharging your phones and Ipods and there's a good sized security locker for every person. There's even a communal fridge. It is cleaned daily. Pineapple Cafe is below the dormitory and has good Thai food at cheap prices, a selection of English foods, a great breakfast menu plus reasonably priced beer and drinks. Pineapple Guesthouse offers free wi-fi throughout. The guest computer, however has died and will not be replaced due to lack of use these days! There's also a laundry service and book exchange. Airport pickups are available at an extra cost. Pineapple Guesthouse is located in Karon Plaza. It's a relatively quiet area, especially in low season, but with a number of bars, restaurants and shops in the vicinity there's plenty to keep visitors occupied. Karon Beach is just four or five minutes walk. It's a beautiful stretch of coastline though it can be busy in high season. You are also within walking distance of Kata and close enough to Patong for an exciting night out.